Home Patreon Support! Community ???? 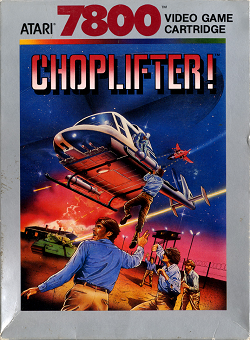 In this review, we prepare for the rescue mission in the Atari 7800 game Choplifter! We find out how well this action game plays. This game was released in 1987. We previously played the Atari 5200 version and found it to be a decent play. So, it makes sense that we at least try the 7800 version as well. This game is, of course, similar to the Atari 5200 version, so we thought it is a good idea to just note the differences between the two games. One noticeable difference between the two games is the fact that gameplay is much faster. While this does make for some more white-knuckled action moments, it comes with a big downside. The downside is the fact that you have a much shorter reaction time. If a jet screams across the screen, you only have a split second to react before the missile comes barrelling down at you. Another thing about this game is the fact that it is much more difficult. Although the first hostage rescue point is fairly straight forward, every other building makes for a next to impossible rescue mission. In fact, after evading the missile, I almost always end up getting blasted by a tank that always magically appears just off screen. It was because of these moments that I simply threw the controller down onto the carpet in frustration and had enough. Something that is new is the fact that you have much tighter control over the rotation of the helicopter. The second button allows you to rotate the helicopter at will. This makes picking off those pesky tanks a much more straight-forward task. The jets, however, seem more invulnerable though. Other then that, gameplay is largely the same. Generally speaking, it is the same game you know and don’t mind made more frustrating and difficult. It’s a very big disappointment because there is a slight increase in raw power on this next generation console to begin with. Unfortunately, it seems that gameplay was simply made worse. Graphically speaking, although there is more color added to the game, some of the graphics seem pretty bad. The tanks, for instance, are very long and oddly stretched out. While it makes for an easier target, they look very strange. The ground is also just one big block of green. It would have been nice to see some small textured grass blades from time to time. The only real decent graphics is the helicopter, the buildings, and some of the background. For the time, it’s ultimately OK graphics, but nothing impressive. The audio is pretty lackluster here. There is the intro jingle, but after that, there is some very basic sound effects. As a result, it made for some pretty bland gameplay. Overall, I was pretty excited to play this game. The port, unfortunately, left me disappointed. While the new generation console held promise of a much more improved experience, a lot of the changes made for worse gameplay. The next to no reaction time allowances made for some very frustrating gameplay. The controls were improved somewhat to allow for better maneuvering of the helicopter though. the graphics were OK, but nothing huge. The audio was a pretty big let down, unfortunately. Overall, I’d say this was not really a good port. If you can, stick to the Atari 5200 version at least. Furthest point in game: 13 prisoners rescued. Drew Wilson on Twitter: @icecube85 and Google+.